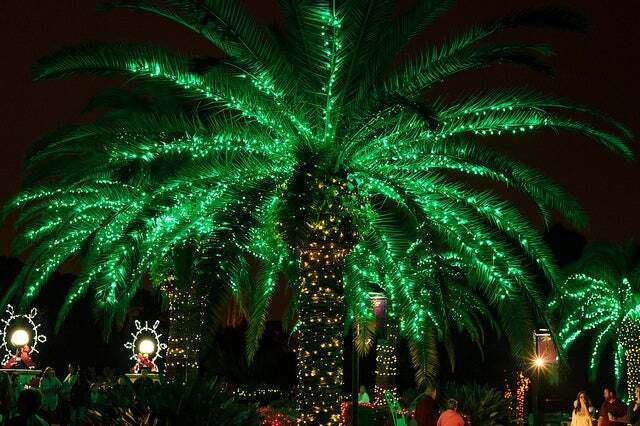 Fort Myers is the perfect getaway where you can celebrate the magic of the Christmas season while sipping cocktails on the beach. The Fort Myers Beach Christmas Boat Parade will put even the biggest Scrooge in the Christmas spirit all while enjoying a nice day in the sun. View our suggested itinerary below for a fun day in Fort Myers Beach capped off with a viewing of the Christmas Boat Parade! Start off your day with a fun activity. Whether you enjoy seeing animals, recreational games, or interesting museums, Fort Myers has something for everyone. The endangered Florida Manatee is a rare sight to see as there are less than 5,000 left in existence. At the Manatee Park, you will be able to view these magnificent creatures in a non-captive warm water refuge, specifically for the Florida Manatees. This would be a great time to visit since the optimal viewing months are December, January, and February. The park also features a butterfly garden and many other interactive amenities. The Bailey-Matthews National Shell Museum features over 30 exhibits from all over the world. Here you’ll be able to view shells in art and history, shell habitats, rare specimens, and a designated place for children to learn. The museum also has exhibits with fossils and models of a giant squid, nautilus, and octopus, the three main surviving branches of Cephalopods (any member of the molluscan class Cephalopoda). At Smugglers Cove, you can find an adventure-themed 18-hole miniature golf course. While playing mini golf, you’ll encounter caves, a pirate ship, waterfalls, and even live baby alligators. For 5 years in a row, Smugglers Cove won best mini golf in Florida! Whether you’re an avid mini golfer, looking for some fun or want to feed the baby alligators, this is a great daytime activity for everyone! After a fun day around Fort Myers, head over to one of the restaurants where you’ll get the best view of the Fort Myers Beach Christmas Parade. For a casual dining experience, make your way to Bootleggers Waterfront Barbeque, Parrot Key Caribbean Grill, Matanzas On The Bay, Nervous Nellies, or Bonita Bills. Whether you’re in the mood for a steak, or some fresh seafood, one of these restaurants is guaranteed to fix your craving. The boat parade passes by all of these restaurants so no matter which venue you choose, you’ll get a great view of the parade. The Fort Myers Beach Christmas Boat Parade has been an annual community tradition for almost 27 years. Last year’s parade included over 30 boats and they promised this year to be even more exciting! This year’s parade, scheduled for Saturday, December 5th, 2015, begins at 6 pm and ends at 8 pm. Make sure you head to one of the restaurants early for optimal viewing throughout the parade as they plan on being very busy. The parade passes through Matanzas Harbor and the first two canals of Siesta Isles. To complete your trip to see the Fort Myers Christmas Boat Parade, book a stay in one of our fabulous vacation rentals. Here at Sun Palace Vacation Rentals, we still have properties available during the boat parade. With plenty to do in Fort Myers, make sure to check the events calendar to make the most of your stay.